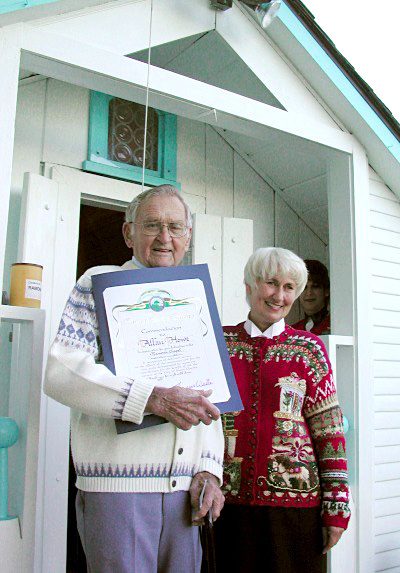 Dec. 9, 2001: Allan Howe receives a commendation from the city of Santa Clarita from Mayor Laurene Weste, upon the completion and dedication of the Ramona Chapel. The Ramona Chapel was dedicated Dec. 9, 2001, to mark the completion of its restoration, which was headed by SCV Historical Society Board Member Allan Howe. A plumbing contractor by trade, Howe, 84, worked on the project nearly every day for more than a year  from August 2000 to December 2001  and painstakingly retooled much of the elaborate woodwork that had fallen into disrepair over the years. Howe based the color scheme on the original; the original colors were revealed as layers of paint were chipped away during the restoration process. Modeled after the chapel at Rancho Camulos  the renowned "Home of Ramona"  the chapel was built in 1926 by Robert E. Callahan as an attraction at his Mission Village in Century City. In the 1950s he moved the chapel and the rest of the village to Sierra Highway in Mint Canyon, where he established Callahan's Old West Trading Post. After his death, his widow, Marion Callahan, donated the chapel  along with a tiny red schoolhouse and other memorabilia  to the Santa Clarita Valley Historical Society in 1987. It is currently one of eight historic structures at Heritage Junction Historic Park in Newhall.